Here are some facts about Medusa. Medusa was a monster in Greek mythology, known as a Gorgon. She had the face of a hideous woman, but had poisonous snakes on her head, instead of hair. She was the daughter of Phorcys, a God of the sea, and Ceto, a female sea God. Phorcys is said to have had claws for legs and skin covered with red spikes. Medusa was originally a beautiful woman with long golden hair. She was punished by the Gods for falling in love with Poseidon. Medusa spent some time wandering in Africa. According to legend, some baby snakes fell from her head, which is why there are so many snakes in Africa. Anyone looking directly at Medusa would be instantly turned to stone. She was killed by Perseus who saw her reflection in a mirror, to avoid looking at her. Perseus is one of the most famous of the Greek heroes. He was sent to kill the Gorgon, armed with a mirrored shield, winged-sandals, and a cloak of darkness. Medusa was killed when Perseus cut her head off. From her neck emerged a winged horse, Pegasus, which has become one of the most well known mythological creatures. 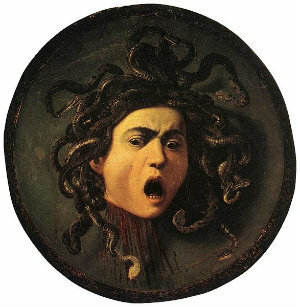 The head of Medusa was often seen to be a protective symbol. She can be seen on roman mosaics excavated in Pompeii, and during the French Revolution she was seen as a symbol of freedom. She has been featured in several films, including two versions of Clash of the Titans. She was the star of a 1964 British horror film, called The Gorgon. Medusa appears on the flag of Sicily, as well as on the flag of a village in the Czech Republic. She has been depicted in paintings by many well known artists, including Pablo Picasso, Rubens and Caravaggio. What next? Discover more about the Ancient Greeks by visiting our resources page. Good Facts, Very Useful keep on going with them! These are the best notes I have 3very use I got hundred on my test because these notes. Thx for the Facts they are great. Loved all these facts about Medusa. At school I didn’t really know much of her nor did my drama teacher. But just by reading this and telling my drama teacher about it, she gave me a fantastic A!! These facts were very useful! These facts are good for the project we are doing in school. Especially the symbolism facts. Great Work! I love the notes! FAB! Wow love em. Really helped me with homework. I’m doing an art project for college on medusa and I think ill use this.